Joe Books LTD, 9781772754865, 528pp. 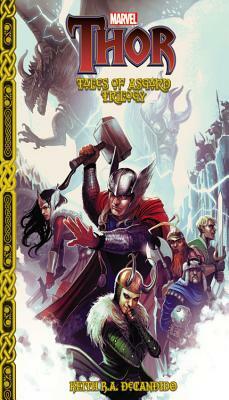 Marvel's Tales of Asgard trilogy tells the stories of Asgard's greatest heroes—Thor, God of Thunder; Sif, the Unstoppable; and the Warriors Three, Volstagg the Voluminous, Fandral the Dashing, and Hogun the Grim. When Thor's hammer, Mjolnir, loses its enchantment, only one being is cunning enough to carry out such a trick: Thor's own adopted brother, Loki. As punishment, Odin imprisons Loki for a year, but the trickster soon takes on other forms and escapes his imprisonment. He provokes a dispute between Odin and the giant Hrungnir—one that soon brings a full-scale attack on Asgard and a one-on-one challenge to Thor himself. When the nearby village of Flodbjerge is terrorized by a dragon, it is Sif who must answer the call for help. Both her reputation and her life are on the line as she faces the fearsome dragon, Oter. The face-off won't be straightforward either—the winged beast has a secret that Sif will have to unravel in order to defeat him before the village and its people go up in flames. Throughout the Nine Worlds, giants are known more for their brawn than their brains, but the Frost Giant Thjasse has come up with an inspired plan: defeat the Aesir not by ending their lives in battle, but by stealing their precious Golden Apples of Immortality and letting time take its course. Is Odin's reign over? Or will the Warriors Three prove that it takes more than brute force and a little bit of ingenuity to topple fighters worthy of sharing Odin's table? Keith's other work includes bunches of other tie-in fiction based on TV shows ( Star Trek, Supernatural, Doctor Who, Sleepy Hollow ), games ( World of Warcraft, Dungeons & Dragons, StarCraft, Command and Conquer ), and films ( Serenity, Resident Evil, Cars ), as well as original fiction, most notably the "Precinct" series of high fantasy police procedurals that includes five novels ( Dragon Precinct, Unicorn Precinct, Goblin Precinct, Gryphon Precinct, and the forthcoming Mermaid Precinct ) and more than a dozen short stories.